I wonder if the shots of Boston were shown across the country, or if this was something regional ABC did. If it were national, then great, but then I gotta ask the question, was our city hall event that much bigger and livelier than anything else in the US? If so, then great again. A friend of mine is San Francisco called me to ask if I was there (I was), since she saw it on the broadcast. I think it was nationwide. They showed Paris, Rome, and Boston that I can remember. It was definitely nationwide because it was ESPN/ABC sports, not channel 5. It was probably worldwide seeing that BBC and other international networks pick up the same feed from the stadium for the game (I believe, could be very wrong), and that they probably shared feeds to get the views in the other cities with different networks. If they where going to show views the great parties around the world, then other networks would pick up on a camera in Boston, because that was insane. "Thousands of Italian and Italian-American soccer fans took over Hanover Street, which the city blocked to all other traffic. Boston police estimated 10,000 more fans from around the world congregated with Mayor Thomas Menino at City Hall Plaza to watch on a 27-by-20-foot TV - enough of a show in itself to get Boston?s scene displayed for all to see on the national ABC telecast. " Yes, it definately was the national telecast showing Boston. Exactly it had to be. The announcer on the broadcast said something along the lines of (paraphrasing) "There's a live look at City Hall Plaza in Boston, one of the greatest cities on the planet". I watched the whole game and I believe they showed that shot 3-5 times. I wasn't counting but it was at least 3. They also showed it during the pregame show. If the announcer made a point to mention the city, it couldn't have been regional. Or else we'd have heard him say the same about other regional cities, and that wasn't the case. I believe it was 4-5 times. Well, the 5 I think would count a mishap in the broadcast. I don't know if anyone caught it but right before the penalty kicks at the end, they had some sort of a video malfunction, and there was a >5 second shot of Boston City Hall Plaza. Also, he mentioned how the North End had some of the best restaurants in the world. I saw that "slip". I thought they were going to cut to the shot again but you're right it was most likely a malfunction. I totally forgot about the North End quote. That was when I ran (literally) to the bathroom and my father was telling me he said that. That's the only bad thing about soccer, there's only a few times in the game you can get up to take a piss. To further beat a dead horse, I'm in Louisville for the summer and we had all the shots of Boston here. It seemed odd at the time that they picked one city from the US to show and then showed the worst place in it. It does seem like having events like that more often could really improve it though. 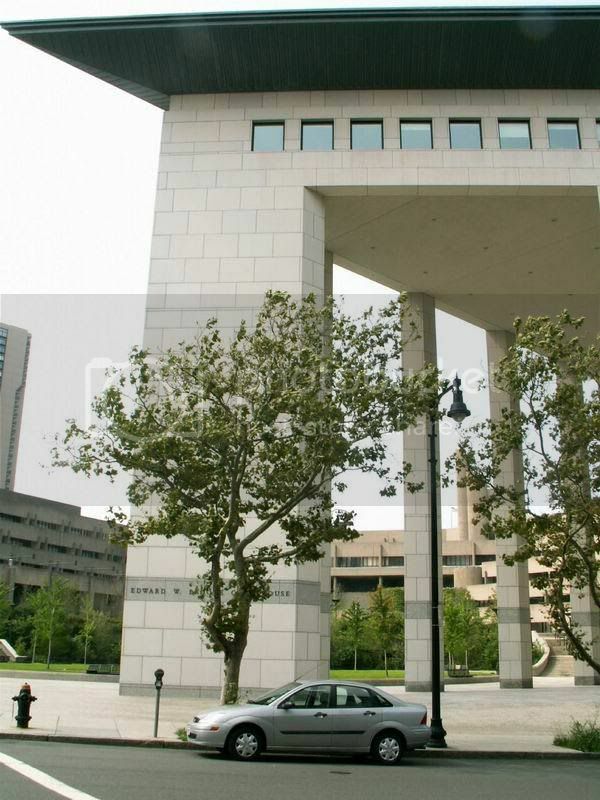 Over the years Mayor Thomas M. Menino has proposed everything from a hotel to "vapor fountains" to liven up the empty expanse of City Hall Plaza. Now the mayor has hit on another idea for the chronically windswept red brick plain: a wind turbine, potentially a 150-foot tall model that could generate up to one-quarter of the electricity used at City Hall. Menino, who has been vowing to "turn Beantown into Green Town" through campaigns to plant 100,000 trees and mandate energy-efficient construction in the city zoning code, has given his top environment and energy aide, James W. Hunt, 60 days to report back to him on the feasibility of an electricity-generating turbine on the plaza. "It would send a message about how serious we are about renewable energy in the city of Boston," Menino said. "We're going to look at it. We want to do it." Many questions remain to be answered: How high off the ground would the turbine blades have to spin to pose no nuisance to pedestrians? How much would a turbine cost? Is there enough wind to consistently generate electricity? And would neighbors, including the federal government, tolerate it? Federal officials blocked Menino's earlier plans for a hotel on the plaza, for fear that criminals and spies would book rooms there to eavesdrop on the FBI and Drug Enforcement Administration's Boston offices. Officials at the US General Services Administration, which manages the John F. Kennedy Federal Building complex on the northwest side of the plaza, could not be reached late yesterday. The high-rise of the Kennedy complex is 387 feet high. Hunt said the city is initially considering a turbine the size of one that operates next to the International Brotherhood of Electrical Workers Local 103 union hall in Dorchester, just off the Southeast Expressway, or one next to Hull High School at the tip of Point Allerton. "That's awesome that the mayor said he would do that," Local 103 business agent Martin E. Aikens said in a phone interview. "It's not a crazy idea. I'd love to help him put a turbine in downtown Boston." Local 103's turbine, a 150-foot tower installed in spring 2005, stands in a parking lot close to the union hall, with blades spinning about 50 feet above the ground. Based on his experience, Aikens said a wind turbine would be a comfortable addition to City Hall Plaza. "You just carry on a conversation like you would," Aikens said, and the sound of the turbine tends to blend in with city and expressway noise. The state's top environmental regulator, Energy and Environmental Affairs Secretary Ian A. Bowles, said he liked the idea. "Even at a small demonstration size, it would be a terrific symbol of renewable energy entering the mainstream," Bowles said. "There's a lot of public-education value in just having a discussion about it." A wind turbine would be a potentially massive addition to the plaza, often used as a staging area for large public events. A 150-foot turbine would reach well above City Hall's 138-foot height. The length of the blades has not been determined. "It could become a landmark, part of the skyline," like the giant new Ferris wheel on the Thames River in London, said Rich Miller, a Bentley College business student from Lexington who was passing by yesterday. Plus, he said, it would be "a good opportunity to see how feasible that kind of energy is." But Matt Holland, a college student from Ottawa, said: "It would seem kind of weird in the middle of this big historic city. Maybe out in a field somewhere, but not in a busy downtown corridor." Over the next 60 days, Hunt said he will evaluate different sites on the plaza and arrange to test wind flows to see how well they would power a turbine. An array of other variables will also have to be examined, he said, including the need to shut down a turbine in winter when ice could form on the blades and drop on pedestrians. Other potential issues include whether the plaza surface - much of which is effectively a brick-clad roof over MBTA Green Line trolley tracks beneath - would be strong enough to support a turbine or whether additional underground supports would have to be built. Meanwhile, officials will also have to consider whether city zoning codes that ban construction affecting the "view corridor" from Tremont Street to the steeple of Old North Church in the North End would prohibit construction of the turbine on the plaza. Both the Dorchester and Hull turbines Menino aides are considering as models for the plaza are on 150-foot-high towers, but because of differences in the size and shape of blades, they produce different amounts of electricity. Boston City Hall uses about 15 million kilowatt-hours of electricity a year, the equivalent of about 2,500 average-sized homes, Hunt said. Stressing that it was only an estimate, Hunt said his initial assessment is that an IBEW-sized turbine could cover about 5 percent of the building's power needs, and the Hull unit up to 30 percent. "What the mayor made clear is that it's not about the amount of energy that can be produced here," Hunt said, "but leading by example and showing what the promise of renewable energy holds for our city and our country." But Matt Holland, a college student from Ottawa, said: "It would seem kind of weird in the middle of this big historic city. Unlike the rest of Government Center? They might as well also install some wind towers along the Wharf District section of the Rose Kennedy Greenway. It will be just as windswept as City Hall Plaza. The Phoenix brought up an interesting point; does this mean Menino's abandoning moving City Hall to the Seaport? Probably. But the real point is that the Federal Government is likely a complete obstacle to any redevelopment of the plaza. Thus, Menino should move the Feds to the seaport. The Boston FBI office is a joke; I'm sure they were worried about Whitey Bulger being the first to book a room in the new hotel! Thankfully, they're looking for space outside of the JFK building which might allow the city to redevelop the plaza. Nothing can make City Hall look attractive as long as the concrete has turned that sickening brownish grey car exhaust color. Since it's impossible to paint concrete, I'd propose covering each surface with a marble panel, like the ones on the Brooke courthouse. Then put a large dome on the top of it, similar to the one at Monticello. In half a century the Brooke, too, will be sooty. But marble is much easier to clean than concrete. I think that City Hall would look really nice in marble, but who has the money?